For any band returning from a self-imposed hiatus, the initial challenge is to see if the old magic is still there. If it is, then a band then has to stimulate those creative musical muscles, fire up those songwriting synapses, and try to write the kind of songs that will push the band forward without trampling all over their legacy. In the case of Scottish rockers, Idlewild, their 2015 "comeback" album, Everything Ever Written was an unqualified triumph. Full of inspired musicianship, anthemic choruses, and spry hooks with Roddy Woomble in inspired lyrical form, it was the album that fully justified their decision to return and gave the band renewed impetus to discover what Idlewild MK II could do next. Their next challenge was to decide whether to stick or twist. To keep going in the same vein, or to try something new and take a few risks. Idlewild's latest album Interview Music is the sound of an established group departing from any formula for songwriting they may have developed over the years. It's the sound of a reinvigorated band, pushing at the edges of their sound and discovering just what they are capable of. It's also their best work, arguably since The Remote Part brought them to widespread public attention way back in the early part of the last decade. Speaking from his home on the beautiful Isle of Mull in the Hebrides, an island that has seen a fair amount of challenging weather over the winter, frontman Woomble's familiar, soft Scottish accent immediately sets you at ease, as he opens by happily discussing what he's been listening to, as the storms roll in from the Atlantic. "My record player's broken so I'm now back on CDs and I'm really enjoying it. I've kind of put them to one side for a few years but now I might not even get my record player fixed. I'm a big jazz fan so I listen to a lot of John Coltrane, Miles Davis, and some of the more esoteric free jazz or whatever you want to call it, and I love Dylan so probably a Dylan record is on every day at some point. With Dylan, I've listened to them numerous times and I'm always discovering something new. The same way, with the great albums you're always finding new sentences that stick out." Since forming in Edinburgh all the way back in 1995, Idlewild quickly grew from their chaotic, punk beginnings on Captain and Hope Is Important. Honing their songcraft on the seminal albums 100 Broken Windows and The Remote Part, the group burst into the big time, a refreshing anecdote to the endless procession of droning Britpop bands riding the coattails of Oasis' unfathomable success. After a run of records that solidified their reputation as one of the most literate and articulate rock bands of the last decade, the band released their "final" album Post Electric Blues in 2009 and that seemed to be that. Time had seemingly been called on a successful career, leaving behind some incredible music and lots of very happy memories. At the time it seemed right for the band to end, with Post Electric Blues putting a natural full stop at the end of the band's career. "I think it was because we felt we'd come to the end of that format, five guys in a rock band." Woomble says, reflecting on the band's decision to stop. "We'd written a lot of really good songs and seen moderate success so we thought 'right, I don't think we can do much more with this.'" While many fans thought it was the end for Idlewild, the door was always open for a return. "We thought, 'let's step off the conveyor belt and work out what the band means to us and come back when it felt right.'" It was when Woomble met up with Rod Jones (Idlewild guitarist) after three years away from each other that the ball started rolling on Idlewild MK II. However, at the time it wasn't supposed to be an Idlewild album. Neither of them knew what would come of the writing sessions. "We started writing songs together and we had a collection of about 12 to 15 and we got Colin involved so it was just the three of us. As soon as Colin got involved we started talking about it as an Idlewild record." From there, the trio recruited Andrew Mitchel and Luciano Rossi into the group to finish what would become Everything Ever Written and a new era of Idlewild had begun. "By the time we finished the record it was a band but it certainly wasn't a band when we started." By the time it came to start writing what would become new album, Interview Music, Idlewild had a greater understanding of how the dynamics worked with the addition of the two new members. "The difference from that (Everything Ever Written) and Interview Music is that it was a band from the very start. Even though we would peel off into writing groups. Maybe me and Rod would write a bit together and sometimes it was me and Andrew but it was a mostly a band record." Having two new members who Woomble describes as supremely talented musicians meant that Idlewild could look at the process of writing in a different way. "We were able to think 'well, let's not think in this straightforward verse, chorus, verse, bridge, chorus.' Maybe what we'd done in the past in Idlewild." As a result, the group were emboldened to try new approaches all whilst consolidating their core strengths. "It made us think in a different way but always in the context of what we are which is a melodic rock band. That's what we always come back to. I mean Rod loves playing electric guitar and distortion pedals and we are naturally melodic songwriters. We always look for the melody in things. It's always brought back to that point. But with Everything Ever Written and Interview Music they're quite different sounding records to The Remote Part and 100 Broken Windows and that is to do with the musical influences and the way we've got more confident in being ourselves." 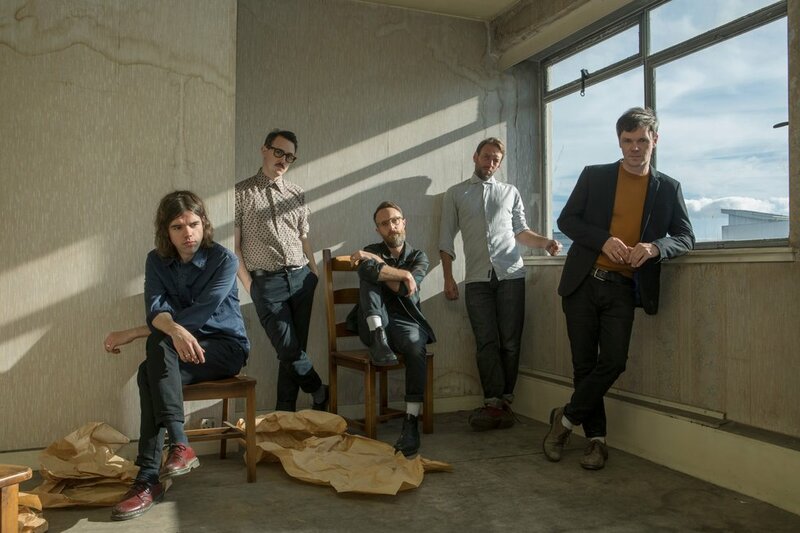 With the new members firmly part of the group by the time Everything Ever Written was recorded, Idlewild were keen to capitalize on the palpable creative energy within the band. "We started writing songs for it (Interview Music) before Everything Ever Written was even out, then when it was released it was so well received we were like, 'let's keep doing this. Let's get a record out in 2017.'" Moral was high with them keen to make hay, but life has a funny habit of making other plans. Jones took over a studio in Edinburgh while Woomble went on to release and tour his, The Deluder solo album. It wasn't until early 2018 after Idlewild's run of anniversary shows for The Remote Part that the outfit reconvened to continue working on those original ideas. In part, this was thanks to the positive response to the shows and reconnecting with producer Dave Eringa who had produced or helped produce all of their albums since 100 Broken Windows. Eringa's role was pivotal in helping the band find renewed focus. "We realized we needed someone to help us finish the record. He came up to Scotland and helped us finish the record. It was a nice journey we went on and the best journeys are always the unplanned one. We went in with a plan and that didn't work so we ended up two years later with a much more interesting record. It's got a bit more life lived in it and I really think, like anything in life that means something to you." So did the songs that they had written in LA still resonate with the band two years later? "Yeah, they did because they were weird!" Woomble says enthusiastically. "I mean "Dream Variations" was like eight minutes, to begin with. I mean it had like a jazz breakdown originally. In LA it was just a splurge because I think we knew we were going to edit. Editing is quite a creative process really. I was always quite excited by them because I like a lot of long jams and jazzy things, Things that are a little off-kilter particularly lyrically so I was always the one pushing for more it to be like that while I think there was a little more restraint by other band members who knew that anyone who likes Idlewild that is not what they want from the band. I think compromise is always the best way." Interview Music may have taken over three years to complete but the frustrations and false starts are what make the finished article so rewarding. "There were moments of frustration, sure, but that goes for anything that's worthwhile. There are ups and there are downs and that's what makes something good. I'm always suspicious of songs that are too easy. Every song that I've worked on that I've felt proud of was hard to come to that conclusion. There's always that thing, with all types of art, but especially with music, that a song is never finished, only abandoned." The finished album could easily have ended up a lot longer considering the number of song ideas the band had. However, Woomble is of the mind that they walked away from it at just the right time. It shows a real breadth and diversity that marks it out as genuinely unique in the Idlewild's oeuvre. "I'm really proud of it because there are a lot of songs that they work together but you wouldn't think so. Like a song like "Forever New" which is a very straightforward, kind of Teenage Fanclub-esque, melodic pop, next to the song "Interview Music", which is like five and a half minutes, about five different sections and a lot of discordant chords, soloing, strange words which are just shouted randomly. I mean that doesn't sound like the same kind of song, it doesn't even sound like the same kind of band! But they compliment each other, they work together which we've shown over the last 20 odd years that we've been a band that we can do that. We're not at this point in our musical lives there's not just one sound that we have to play to." Idlewild are a band who have always worked to plant the literary seed in the listener with Woomble's, often wonderfully oblique lyrics inviting further investigation and analysis. Naturally, I'm interested to know what particularly influenced Woomble's lyrics on Interview Music. "I would say that the surrealist poets and surrealist poetry have a big influence on me. Paul Eluard, Andre Breton. Also, I'm a big fan of Scottish poetry particular Norman MacCaig, George Mackay Brown, etc. Old fashioned romantic poets that wrote a lot about landscape and the human condition using simple but beautiful language. That's my main two influences word wise and a lot of my songs have an element of both. Often, they're a bit vague and dense as I try and get out what I have to say while some are quite simple and they're about a kind of belonging and trying to belong whether that be with someone or in a place. I mean now, I'm a 42-year-old man and I have a better sense of where I am in my life. However, there are always those questions. The great surrealist question is "Who am I?" That's something that never leaves you ever. I work it out through art." Songs like "All These Words" and "Familiar to Ignore" feature leftfield snippets of incidental music that knit the whole album together, allowing the album to veer from hazy, psychedelic moments to melodic pop songs with ease. It's these elements that imbue the album with a freshness and in turn mark Interview Music out as one of their most interesting albums to date. Woomble explains where the idea came from. "I was quite interested in that and to a degree Rod was. But the compromise was that we decided to do this incidental music between tracks like a soundtrack. The theme is that Interview Music itself is a bit like a soundtrack. We were trying out a lot of different ideas and quite a lot of it are like rehearsal tapes put through effects. If you hear clapping or coughing and hints of melody that's because it's rehearsal tapes put through delays and things." For Woomble, Idlewild have never been in the position where they have had to keep pursuing a particular formula. They have always felt comfortable enough to keep evolving their sound within the parameters of a rock band, safe in the knowledge that their fans would join them on the journey. "The way it's worked and the way we've developed as a band, that's interesting for the fans too who have grown up and changed. I think it's a fair exchange between band and fans of the band. We've never had a big enough song that we need to keep repeating. We've never had a hit that people are just there for one song. We've only ever had fans who are into the records and want to hear albums tracks. We're lucky in that way." In previous interviews, Woomble has emphasized how important it is to know just what kind of band you are. Therefore, the obvious endpoint is to ask him whether he knows what type of band this new incarnation of Idlewild are. "It's difficult to explain but I do. I know what we can do. What we're capable of. I mean that always changes with time. You can't really plan that; that's just got to happen. I think principally we're a rock band. If someone asks what type of music we play, I always say we're a rock band and if that makes them think of AC/DC that's their problem. But I see the Smiths as a rock band, Nirvana as a rock band, Pavement as a rock band. I think within that you can do so much. You can be any kind of band. I think this band is really diverse for a rock band from Scotland."